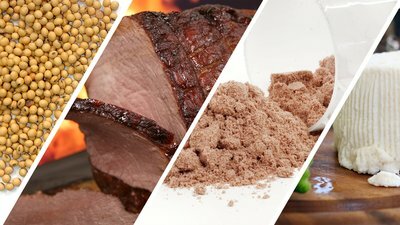 Are You Getting All You Need From Protein? To building muscle, it's not enough to just consume lots of protein. You've got to make sure that protein contains the most important muscle-building amino acid of all. Here are four great ways to get it. Protein plays a big role in building muscle mass. But what's often lost among all the protein powder and beef is the fact that leucine, an amino acid found in many protein sources, plays a significant role in that muscle growth. The more leucine you have in your blood following a resistance training workout, the more muscle protein synthesis (muscle-building) that can take place. I'm not suggesting you supplement with leucine only; the other amino acids are important, too. But I am strongly encouraging you to choose leucine-rich sources to get the most muscle-building bang for your buck. Amino acids are the building blocks of protein, and of the 20 amino acids used by the human body, nine are considered essential (EAA). This means the only way to get them is through the foods we eat or the supplements we take. Of all the EAAs, leucine stands out because of its role in triggering muscle protein synthesis. Essentially, leucine acts like an anabolic switch: Once your body has access to enough of it, your cellular machinery is turned on and can start building and repairing your muscle fibers. Of course, you need to do an adequate amount of resistance training for this to happen. But by combining your training with a good source of leucine-rich protein, you can maximize this muscle-building response. How Much Leucine Is Enough? Your body needs an estimated 3 grams of leucine to optimize the muscle-building response. The exact amount you need depends in part on your age, weight, and gender. But, in general, most people need 25-35 grams of high-quality protein per meal to hit 3 grams of leucine. So, where do you get it? Whey protein contains more leucine per serving than any other protein source. Adding a scoop of whey protein powder to your post-workout shake is an easy way to give your body the leucine it needs. This lean cut of beef is also budget-friendly. Slowly simmer it in liquid, or use a marinade to help tenderize this tasty but tough meat. Ricotta is made using the liquid whey left over from other cheese production. With all that whey, it's automatically full of muscle-friendly leucine. But don't wait for lasagna to get your ricotta fix! Use ricotta in smoothies, pancake batter, and dips. Mix it with chopped smoked fish and seasonings for an inspiring sandwich filling or cracker topping. Let your imagination run wild! These crunchy dehydrated soybeans are one of the best plant-based sources of this muscle-making amino acid. Grab a handful for a snack, or toss them onto yogurt (also a source of leucine). Phillips, S. M. (2016). The impact of protein quality on the promotion of resistance exercise-induced changes in muscle mass. Nutrition & Metabolism, 13(1), 64.